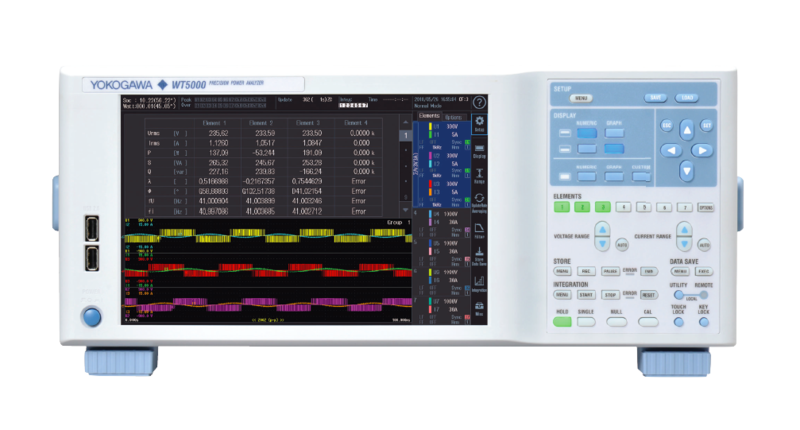 Yokogawa developed the PX8000 precision power scope, a high-accuracy power meter, which can measure reactor losses in inverters, motors and the like, by analyzing waveforms. The major specifications of the instrument are as follows: basic accuracy is 0.2%, voltage measurement bandwidth is DC and 0.1 Hz to 20 MHz (-3dB, typical), and current measurement bandwidth is DC and 0.1 Hz to 10 MHz (-3dB, typical). The PX8000 offers the functionality usually provided by a waveform measuring instrument, such as a variety of triggers, tracking, statistical processing, and waveform parameter calculation functions. Furthermore, to improve measurement accuracy at low power ratios this product comes with a de-skew function for correcting signal delays from the current sensor and a data latency adjustment function. This paper describes the PX8000, focusing on a newly developed element dedicated for power measurement and technology for phase correction.